Something just like that plays out countless times here at the Baker Airguns repair center. The use of inappropriate cleaning and lubrication products is to blame for a very large percentage of the repairs that we do here. We can usually tell what someone has used on the gun just by smell. Using the incorrect lubes and cleaners on an airgun is an innocent mistake that anybody could make. Unfortunately, it’s a death sentence for your airgun seals. Products like WD40, PB Blaster, 3 in 1 oil, and most firearm lubes and solvents have additives such as acids, detergents, and other detrimental things in them. These products are great for their intended uses, but cleaning and lubing airguns isn’t one of them. I don’t claim to know precisely the ingredients of every lubricant on the market, but I do know how they affect airgun seals. In a word, they affect them negatively. Very negatively. You might get away with using something like that in the short term…but the fate of your seals is…well….sealed. This information begs the question, “So what should I use on my airguns?” Let’s start with a cleaning solvent. You should never use a firearm solvent like Shooter’s Choice or Hoppes #9 on an airgun. If I need a solvent (which is rare past the initial cleaning of the packing grease/assembly lubes from a brand new airgun) I use 91% isopropyl alcohol. It is a strong de-greaser, easily obtained, cheap, and very effective. Most importantly, it’s inert so far as the seals are concerned. There are other suitable solvents, but I will only recommend 91% isopropyl alcohol. That brings us to lubrication. Before I recommend specific appropriate lubes for airguns, I want to address the appropriate amount of lube for an airgun. That amount is VERY LITTLE! No matter what type of powerplant your airgun may have, it does require some lubrication. This does not mean that it needs to be slathered in oil like a competition bodybuilder. A little goes a long way. We’ll revisit the “amount” issue shortly. So what about types of lubes? Basically, there are three usual types of airgun lubricants. Silicone oil, petroleum oil, and greases. Each have their specific appropriate uses. There are many types of greases that are sufficient to use on trigger components or levers, or anywhere there is extensive metal to metal contact. Many people use a molybdenum-based grease on the heavy metal mainsprings in piston guns. Moly is somewhat toxic, however, and should only be used in places that will not be in contact with human skin. A lithium or petroleum-based grease is a better choice for links and trigger components. Silicone oil, sometimes called “chamber oil”, is the only type of oil that you should ever use to lubricate inside a piston gun chamber. I typically use Crosman Silicone Chamber Oil. You should always follow the manufacturers recommendations for cleaning and maintenance, but two drops of silicone oil in the chamber every 500 shots is what I do to my own guns. It is absolutely critical that you never use a petroleum-based oil for this task, as the petroleum can ignite in the chamber due to the high-pressure environment. Silicone is also the only lubricant that should be used on a PCP airgun, and for the very same reason. Petroleum based oils, such as Crosman Pellgun Oil, are still the standard for multi-pump pneumatic airguns. It can be used on the entirety of the gun safely. This doesn’t mean you should dunk it in a barrel of the stuff, though. Two drops on the plunger assembly every 500 shots is about all the lubrication that the internals need. You can also use it to lube levers, hinges, trigger components, and even wipe the entire gun down with it. On CO2 guns, you always want to put a single drop of Pellgun oil on the tip of your CO2 cartridges before you insert them. 1) You should only use specific airgun oils on airguns. Never use automotive, household, or firearm lubes or solvents on an airgun. 2) Never use a petroleum-based oil to lubricate the chamber of a piston airgun. 3) Never use a petroleum-based oil on a PCP airgun. 4) Do not over-lubricate. A little goes a long way. I hope this blog helps to keep your airguns up and running. As I mentioned, we see the unfortunate results of using the incorrect products on airguns every single day….and it’s not pretty. The correct products to use are cheap and readily available. Do yourself a favor and get some, as it’s much cheaper than paying for a repair. Donnie Reed is our Sales Manager and general airgun guru here at Baker Airguns. He was a member of the U.S. Marine Corps, and qualified as both a Rifle Expert and Pistol Expert. 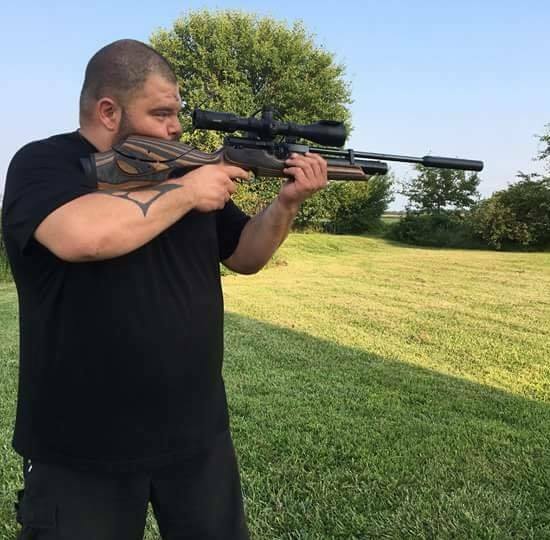 Donnie is now a competitive airgun shooter, focusing primarily on field target and benchrest competitions. He has won both PCP and piston class field target matches, as well as local benchrest competitions. Donnie also runs the Youtube channel and Facebook group ALL THINGS AIRGUN. His first college degree is in Mathematics and Sciences, but he is still pursuing another in Physics and Astronomy.